Diana Rattray. The Spruce Eats, 2017. 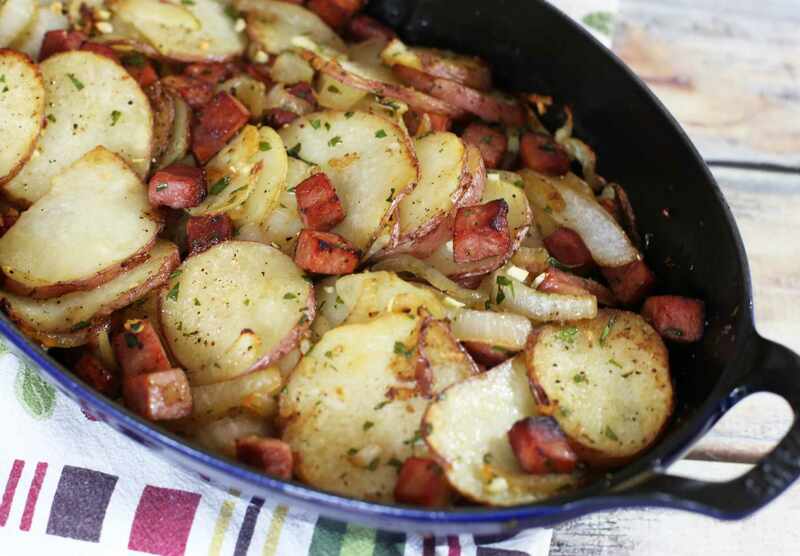 This one-dish roasted potato and ham dish is seasoned with garlic, onions, and fresh parsley. This macaroni and cheese is the perfect combination of cheeses. The ham and bread crumb topping make it a complete meal your family will ask for again and again. Diced ham and shredded cheese make this pasta salad hearty enough for a hot weather supper. Or take it along to a potluck or cookout. This ham and asparagus casserole is made with a simple cream of celery soup sauce, cheese, and stuffing crumbs. The sauce for this tasty pasta bake is made with some beer, but feel free to replace the beer with chicken broth or more milk. This is an easy dish to prepare and bake. Serve this potato and ham bake with a tossed salad and biscuits or hot rolls. This pasta dish is a great way to use leftover ham and fresh spring asparagus. The sauce is a simple combination of cream and Parmesan cheese. A homemade mushroom sauce brings this spaghetti and ham casserole together. This makes a fabulous everyday dinner with crusty rolls or biscuits and a salad. This versatile ham and egg bake makes a delicious breakfast or brunch dish. Add some green onions or bell peppers if you'd like. Cooked penne pasta is baked with a cheddar cheese sauce, diced ham, and English peas. The buttery crumb topping adds texture. This yummy quiche makes a delicious brunch or lunch. The quiche is topped with sliced tomatoes. This is an excellent way to use leftover mashed potatoes and ham from your holiday dinner. The croquettes are made with a simple mixture of ham, potatoes, minced onion, and bread crumbs or flour. Sweet pickle relish flavors this tasty Southern-style ham salad. Serve it on soft sandwich buns or mound the ham salad on lettuce leaves or salad greens. Steamed broccoli and ham are featured in this simple creamy pasta casserole. The very easy sauce is made with cream and Parmesan cheese. Serve these Southern mustard greens with vinegar or pepper sauce. These little sliders are always a hit. The rolls are filled with thinly sliced ham, cheese, and a tasty mustard and onion sauce. This version of Lowcountry red rice is flavored with diced ham, bacon, and green onions. Swiss cheese, turkey, diced ham, and vegetables make this a delicious and colorful pasta bake. Use leftover croissant crumbs or soft bread crumbs for the topping. Serve this fabulous pulled ham with the South Carolina mustard barbecue sauce.